• Gain-Phase: The data should be stored in a text-file with three columns. 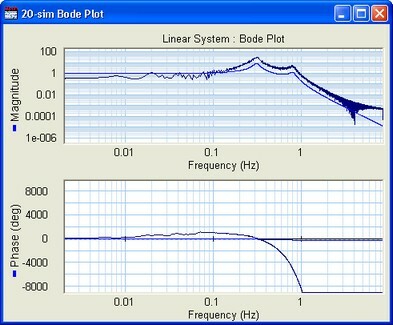 The first column should contain the frequency and the second and third column, the corresponding gain and phase data. • Real-Imag: The data should be stored in a text-file with three columns. The first column should contain the frequency and the second and third column, the corresponding real and imaginary data. 1. Open the Linear System Editor with your linear system. 2. Open the plot (e.g. Bode, Nyquist) in which you want to show the data. 3. Set the Magnitude (- or dB), Phase (rad or deg) and Frequency (rad/s or Hz) according to the data you want to import. 4. In the Linear System Editor from the File menu select Import. 5. Select Import Gain-Phase or Import Real-Imag. Now a file dialog opens helping you to select the file to import. When you have selected a file and closed the dialog, the data should be visible in your plot. An example is shown in the figure above.